I shot a lot more this year, with the goal of making the training squad for the Scottish 2010 Commonwealth Games Team. Unfortunately, this didn't happen, it was just a dreadful year for me. I put a lot of effort into archery, and just didn't get the performance that I wanted. I only discovered that this tournament was happening the day before, and wasn't mentally or physically prepared for it. I shot the Fita on Saturday and the 720 round on Sunday, but was shooting so erratically I didn't continue with the eliminations. I as shooting so inconsistently the week before this tournament that I decided to skip the Fita on Saturday, and just shoot the 720 round and double elimination on Sunday. I was still a bit inconsistent, but managed one good twelve arrow elimination pass. This was the first time I'd been to Maple Ridge Archery Club's new shooting venue at Selvey Park. It's much nicer than the old venue, it's sheltered on all sides and is quiet. I had been working on tuning and timing for the weeks before this tournament, and have finally got a new set of arrows set up. I changed the points a couple of times, and altered my clicker position to avoid overdrawing. These changes helped with my previous inconsistency, but I was still letting down an extra arrow or two on each end. This was a pretty disappointing weekend, but some good came out of it. I had made some equipment and form changes in the previous week. Saturday's 70m round was a test of them under competition conditions, since it wouldn't count for any selection or ranking. The equipment changes turned out fine, but the form changes did not work, so I reverted some of them at the end of the tournament. I was still feeling pretty optimistic about the Fita on Sunday, but when I got to the field on Sunday I discovered that the tournament was cancelled. The judge was sick, and the lights and timer had been stolen from the lock-up (fortunately they have since been recovered). A couple of weeks before this tournament, I had some time with a world-class archery coach, Alexander Kirrilov. I spend the time between that coaching session and this tournament working hard on the form changes we identified. Unfortunately, my grouping became more erratic over that period, so I knew this tournament would be hard. What I didn't know was quite how hard it would be, psychologically and emotionally. It was very obvious right from the start that a good score was not going to be easy, so I tried to just focus on working with my technique. The Fita ended up being my second worst in 15 years. I stayed behind after the Fita to practice some more, and thought I got some idea of what was wrong. My shot felt pretty good the next day during the 70m and match rounds, but I had more dismal groups and dreadful scores. The effect of two days of this has been total demoralisation, and a complete loss of confidence. In an odd twist, it appears that my four worst scores in the last 15 years have been on my home field; I have never shot what I would regard as a good score in a tournament there. Fourth. My scores were bad, but not as bad as I'd feared. My shot still hadn't returned, so I spent the weekend trying to find my form, and trying not to get depressed or frustrated by it. I'm not sure how well I succeeded in either, but the weekend took a turn for the better (the best!) when I heard that my best friend's first child had been born. I got to go and visit them and see their lovely day-old baby on Sunday after the tournament. My practice during the week before had been slowly improving (including this neatly split nock). In the practice at 90m on Saturday, I shot one nice relaxed end, putting all of the arrows in the yellow for an end of 57. However, it didn't last and throughout the weekend, I felt that I was getting into line quite well, but was unable to make the shot move through the clicker. Between both days, I could have put together a reasonable score, but individually they were a little bit disappointing. 30m award. Between the time I arrived on Wednesday and the start of this tournament on Thursday, the rain just poured down. The field was completely soaked, but the rain did hold off for most of the weekend, apart from one thorough soaking on Sunday afternoon. My nightmare year continued with poor performances both days. As with much of the year, I was trying to execute the shot cleanly, and felt that I was succeeding much of the time, but the results did not correlate with what I felt. First. 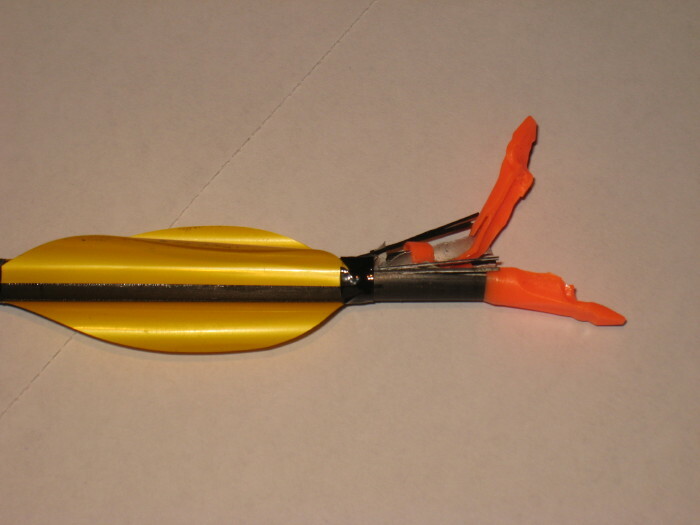 After two weeks without a bow, just training with a rubber band, I continued to shoot poorly during the Fita Thistle on Saturday. I won, but only because the top archers registered did not turn up. I haven't shot a York for years, so when I entered the tournament, I thought that I'd likely be setting a personal best and/or getting an 1100 Rose on Sunday. After reviewing my recent performances, I decided that I wasn't enjoying shooting badly, and I just didn't believe that I was going to shoot as well as I had expected. I decided not to shoot on Sunday, and went for a very pleasant walk with my mother in the hills above their house. I cut short another dreadful performance, retiring after the 50m distance, because my shoulder hurt. Bad luck played its part too; a flinch and miss at 50m put an arrow into the grass, where it hit one of the few rocks on the field and exploded. I was still hopeful that I could shoot reasonably in Sunday's 70m round, but I just couldn't make the shot work on Sunday either. The elimination round was reduced to a single elimination, and I was out in the first round. A dreadful 90m included the first arrow I've shot on the wrong target for years, and continued with two more misses. Sunday's round started out better, but the middle distances were once again a disappointment. The final 30m distance ended up with a nice three-X 30, but not before Hugh MacDonald had completely destroyed another of my arrows, Robin Hooding it with an X10 that went more than 9 inches into the back for my arrow. All of the arrows on the target were 10s, so it did make a pretty picture. The year so far had been so bad that drastic measures were needed, so in the week before this tournament I built my grip up even further, wound the bow weight up, cut half an inch off the arrows, and increased the point weight by 20 grains. My bow tune was definitely improved by these changes, but the longer distances of the Fita didn't really reflect that. The results improved in the shorter distances, as I started to have confidence in my shot a bit more. A particularly good last dozen arrows gave me the first 50m over 300 for three months, and my first 1200 for three months. The first half of Sunday's 70m round continued in the same vein, with my first 70m over 300 for three months, but the second half was a collapsed badly, with no discernable reason. The collapse continued through all of the rounds of the double elimination; I had one or more arrows into the blue for every end during the matches.